The purpose of the INPA College Photographer of the Year contest is to promote excellence in student news photography; to persuade the general public that news photographers are instrumental and important in the reporting of news and the recording of daily life in their communities; to teach beginning photographers about photojournalism; and to help working news photographers improve their photo-reporting abilities. Any person who has attended an accredited college or university in the State of Indiana in the [cgv poyyear] calendar year (January 1, [cgv poyyear] to December 31, [cgv poyyear] ), or who interned for an Indiana news outlet while attending a college or university in another state is eligible to enter. There is no fee for entering the INPA College Photographer of the Year contest. Students are encouraged to join INPA, and may enter the Annual Still Contest, Annual Multimedia Contest, and Monthly Clip Contest after doing so, but may not enter the professional and student contests in the same year. Photographs taken or initially published between January 1 and December 31 of the contest year ([cgv poyyear]) are eligible for entry in the contest, so long as they were taken while a student, or while on an internship during that year. Work made while an employee in a non-internship or educational setting is not eligible. The annual contest chairman may request original files for images that may appear to be problematic with regard to toning, content or ethics. The original and the entered image will be presented to the judges for a final determination. The judges may also disqualify any images they feel go beyond the allowable industry practices at any point in the competition. This category determines the Indiana College Photographer of the Year (Indiana CPOY). It is a body of work by one photographer from the previous year, displaying photographic excellence, versatility, technical quality and originality. A portfolio may contain no more than 20 entries. A story or essay counts as one entry. A portfolio must contain images from at least two of the following categories of images: news, feature, sports, portrait/personality, news story, feature story or sports story. Portfolios are judged on the basis of photographic excellence, subject matter, versatility, technical quality, and originality. Images can be arranged in any order but picture stories must be last. A story or essay must be separated from the singles by a black frame. This frame does not count towards the image total. Portfolio is a still photo only competition. Entrants are not required to compete in the singles categories in order to compete in the portfolio competition. Judges must award a first place (Indiana College Photographer of the Year). All other places are optional at the discretion of the Judges. N – News: A photo from a news event – spot or general – which has immediate news value. S – Sports: A photo from a sports event capturing athletic competition at any level. May be either feature or peak action. R – Portrait/Personality: A picture of a person that reveals the essence of the subject’s character. An entrant is limited to a total of 20 entries in portfolio. A multiple (story) counts as one entry in this portfolio. An entrant is limited to 15 images total in the singles categories combined. A minimum of five entrants must enter each category (P, N, F, S, R) for it to be judged. Contestants who do not follow the rules will be disqualified. INPA will take every precaution in handling entries, but cannot be responsible for loss, damage or non-receipt of entries. All entries must be uploaded by [cgv poydeadline], noon (Eastern Standard Time). The contest will have three judges as selected by the annual contest chairman. Judging is open, which means spectators are invited to watch and listen as the judges make their determinations. Spectators must not talk to the judges or make loud comments, which could be overheard by the judges. After each category is judged, spectators are encouraged to ask questions and discuss the category with the judges, only in general terms. Discussion of specific images should be held until all judging is complete. All entries must be saved as a JPEG file with IPTC standard captions and file information. Files should be sized no larger than 2400 pixels on the longest side. Files should be saved at a JPEG compression level of 8 or 9 (high). Images deemed too large may be resized at the discretion of the annual contest chairperson. Description/Caption: The photo caption. This field MUST NOT include the photographer’s name or affiliation. It is recommended that picture story entries include a paragraph explaining the package before the caption of the first photo. Entry images must be renamed using the following format: cpoy_category_photographers name/city initials_seq.jpg. Note: the entire filename must be lowercase. The only non alpha numerical (a-z, 0-9) character allowed in the file or folder names is an underscore. All entries must be placed in a folder named with CPOY proceeded by an underscore and your initial+city code (i.e. cpoy_jjds). 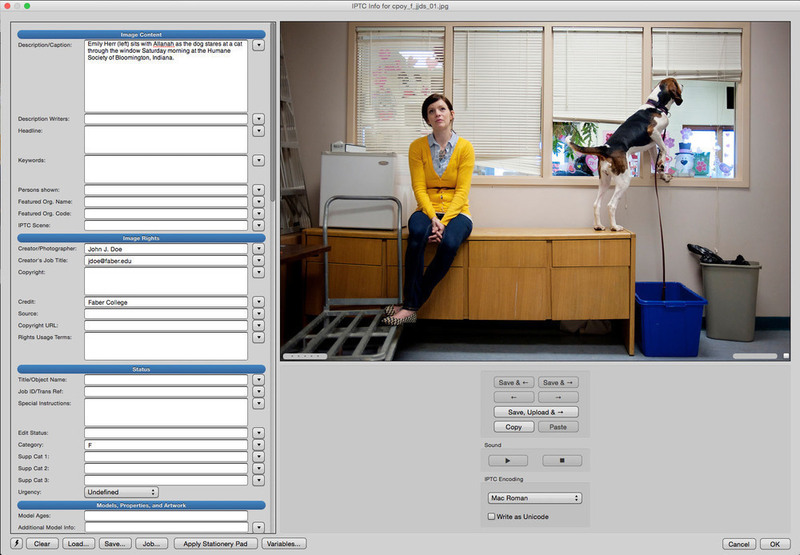 All images should be in the root of your entry folder with the exception of the portfolio. Portfolio must be in a seperate folder within the root folder (see example below). If you are entering the POY contest as well, create a separate entry following the POY contest entry procedures. Your final entry must be saved as a zip file named with your initial+city code (i.e. 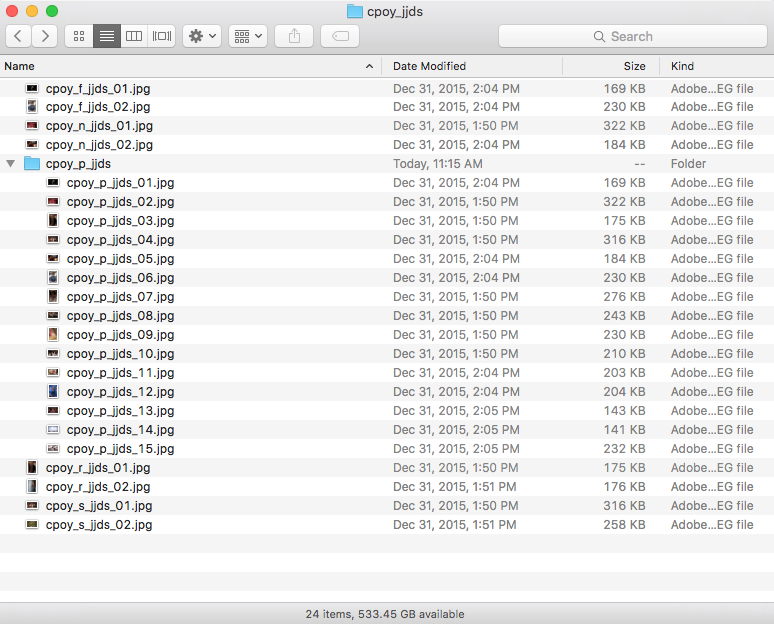 cpoy_jjds.zip).